Peterson Equipment Company runs a very tight ship when it comes to our spare parts department. Why? Because we know you only run your Pistenbully for 5 months a year, so we have to make sure that reliability is a top priority. How do we do that? Together with our partners at Pistenbully we have developed the most state of the art Spare parts ordering system in the industry. 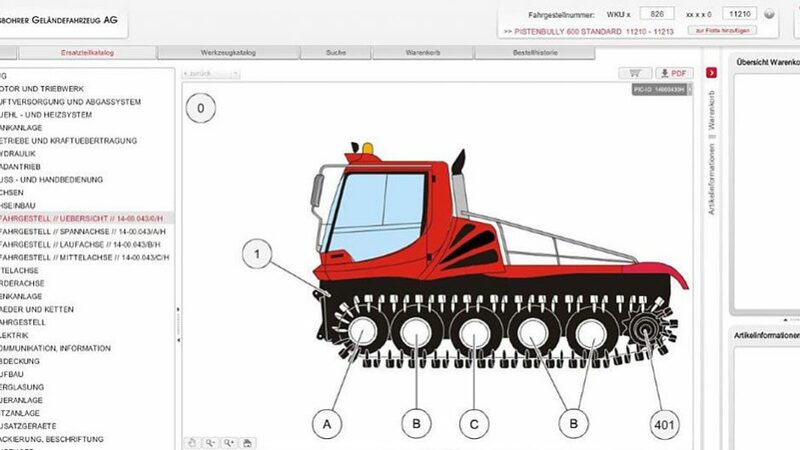 The competition has nothing to compare to the Electronic Parts List by Pistenbully. Simply login, drop the parts in the basket at any time of day, and hit send. Your parts arrive nearly instantly, and you are back on the trail. Peterson Equipment Company takes Spare parts distribution one step further. How do we do that? In our Spare Parts department, we do everything within our power to live up to the motto that “Every Part Ships Every Day”. If we have the part, it ships. If we don’t, we do everything in our power to get it moving that day. In addition, we do our best to make sure you know what is going on. Peterson Equipment believes strongly in the motto People, Product, Process. We believe in creating an environment that enables team members to perform the best for our customers. Our team is dynamic, and skilled in their field. In Product we have teamed with the world leader in snow grooming, Pistenbully, and we wouldn’t have it any other way. Many other manufacturers have seen the satisfaction from our customers, and have approached us with lucrative distribution deals. We re affirm our commitment with Pistenbully to be the best at what we do, and they continue to provide a top quality product. Our Processes at Peterson Equipment are a key ingredient to success for our customers. Thru the process that have developed during the 55 years of our time in the market, we polished the way we do business to make sure that it is customer focused. Go ahead, sign up for a spare parts account here: epl.pistenbully.com. and start learning more about your Pistenbully. Please, give us a shout and let us know how we can help you.